EA's popular tower defense game has received new plants, zombies and levels set in a dangerous jungle environment. EA Mobile has announced the latest major content update for its popular mobile tower defense game, Plants vs. Zombies 2. The update takes players to the Lost City, and is split into two portions, with Part 1 available now. 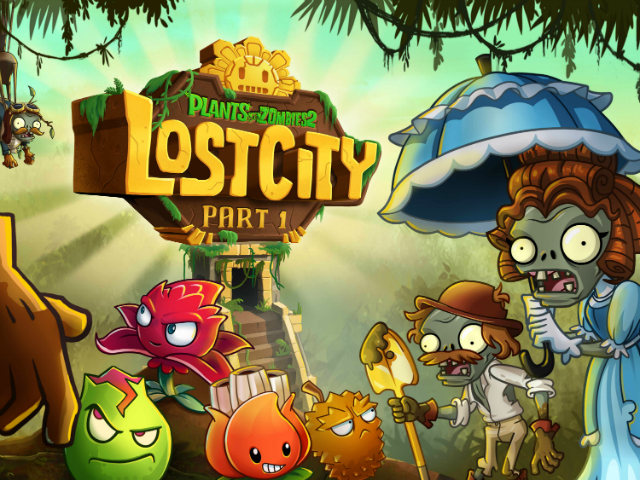 The Lost City Part 1 is a new jungle world, offering over a dozen levels to complete, ten new zombies to exterminate and four new plants to collect. EA Mobile recently showed off the update in a developer diary. The Lost City Part 1 offers 16 new levels, as well as new special zombies, including the Zombug, Zombie Jane, Lost Pilot and Excavator. Zombie Jane carries a parasol used to block overhead attacks, while the Excavator carries a shovel used to block oncoming projectiles. Players can defeat these zombies with their favorite plants, or four new options: the A.K.E.E., Red Stinger, Endurian and premium Lava Guava. The Red Stinger changes form in relation to its distance from base. When placed at the left of the board, the plant has an offensive stance, but the farther to the right it’s placed, the more it covers itself with its petals as a form of defense. The plant’s various forms perform differently in battle, so gamers must strategize its placement. Meanwhile, the A.K.E.E. can be used to lob shots onto zombies’ heads, while the Endurian serves as a barricade, slowing zombie advancement while also causing some damage. Finally, the Lava Guava causes explosive damage to a group of zombies, leaving behind a magma tile that will damage future zombies in the same path. In addition to new plants and zombies, this update’s new levels include golden tiles. When players deploy plants on these golden tiles, they receive sun, and will continue to receive bonus sun as long as the plants live. Plants vs. Zombies 2 is available to download for free on the iTunes App Store and Google Play. The game has been downloaded over 100 million times since its release in 2013.